Proudly serving Buffalo and Western New York for more than two decades. T-Mark Plumbing, Heating & Cooling is the right choice for regular upkeep, skilled repair, and emergency plumbing services across Buffalo and Western New York. T-Mark Plumbing, Heating & Cooling offers both residential and commercial air conditioning services across Buffalo and Western New York. You can count on us 24/7! We provide dependable commercial heating & cooling services. Our focus is 100% customer satisfaction, and we earn it through superior results! Our team of professional technicians, installers and repairmen are standing by to help with your needs whenever you need us. Contact us today! We’re available 24/7, 365 days a year! 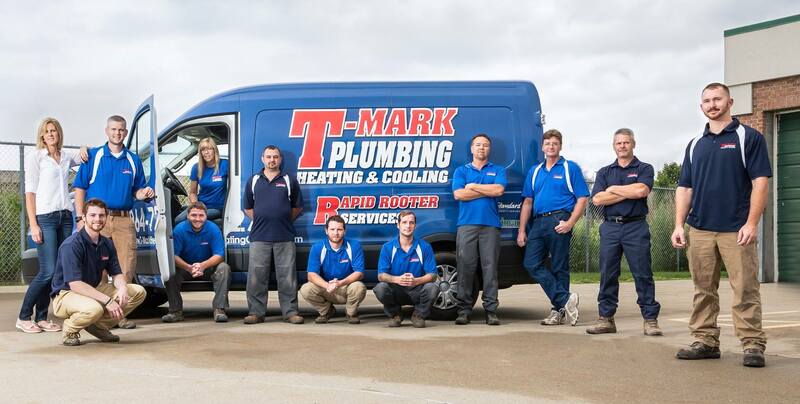 As a local, family owned and operated business, T-Mark Plumbing, Heating & Cooling simplifies the everyday challenges of running a home and/or business in Buffalo and Western New York. Committed to superior service and products, we provide effective, lasting, and economical solutions to your residential and commercial plumbing, hot water, and temperature control requirements. When you call on us, we focus on 100% customer satisfaction, earning your approval through convenient appointment times, rapid turnaround, and neat and tidy job sites. T-Mark Plumbing, Heating & Cooling specializes in a wide range of services, from regular maintenance and equipment installation to prompt repair, making us your one-stop source for cost- and time-savings. Rest assured, the dedicated and qualified team from T-Mark Plumbing, Heating & Cooling is always available to assist you with twenty-four hour, seven-days-a-week, emergency repairs throughout Buffalo, NY, Kenmore, NY, Tonawanda, NY, Amherst, NY, Williamsville, NY, Cheektowaga, NY, Orchard Park, NY, Hamburg, NY, West Seneca, NY, Lancaster, NY, North Tonawanda, NY. Contact us at 55T-MARK and speak to a knowledgeable representative of our staff. We pride ourselves on resolving all issues quickly. With over twenty years in business, we are familiar with the demands and consequences of severe local weather. Customizing our services to better protect your interests, we deliver proven rewards and target your specific requirements. Through personalized attention, we ensure results that exceed expectations. Have confidence in our history of higher standards and take advantage of our commitment to quality. “I Need AC Repair Near Me” – T-Mark Can Help With Your AC Repair & Service Near Buffalo! If you’re looking for the most trustworthy local ac repair, service, or installation, don’t wait to call T-Mark Plumbing, Heating & Cooling. We hire certified and qualified technicians to make sure your air conditioner is working properly so you don’t have to call us down for a followup. Whether you’re looking to repair your old air conditioner, or service the unit that’s at your home to help reduce the wear and tear on its components and prolong its life, we can help. Our technicians are all honest and not looking to upsell you on unnecessary parts, services, or products, but if your old air conditioner is too old to repair affordably, we can talk to you about a high energy-efficient ac replacement for your home. For air conditioner repair, service & installation in Buffalo, Kenmore, Tonawanda, Williamsville, and most of Erie County, call 55T-MARK today! If you’re in need of boiler repairs, service, or you’re looking to replace your current boiler, you’ve come to the right place. T-Mark Plumbing, Heating & Cooling are experts in performing all types of boiler services and we’re standing by 24/7 to help you! Whether you just need to repair and old boiler, or maybe you need to install a boiler at your new home/business, we’d be proud to provide you with excellent service and an energy efficient heating system. Trust T-Mark Plumbing, Heating & Cooling for all of your boiler repairs, service, and installation needs in Buffalo, NY, Kenmore, NY, Tonawanda, NY, Amherst, NY, Williamsville, NY, Cheektowaga, NY, Orchard Park, NY, Hamburg, NY, West Seneca, NY, Lancaster, NY, North Tonawanda, NY. T-Mark Plumbing is proud to offer high-quality friendly local plumbing services to Buffalo, Kenmore, and the surrounding areas. Our team of expert plumbers can help you with your sewer cleaning job no matter what the size is. Whether you have a clogged drain in your basement or bathroom, or you need to have your sewer jetted between your home and the street, our team can handle the job with honesty and integrity. For any questions relating plumbing, drain/sewer cleaning, and our other plumbing services, please don’t hesitate to call or chat with our team today!